Still time to enter Everything Dinosaur’s super, soft toy giveaway. We have one big, pink and very cute soft toy which needs a home. It is a reindeer and very sweet and cuddly it is too, but our palaeontologists have been pretending that it is a Megaloceros baby – can you give our soft toy a new home? Win a soft toy with Everything Dinosaur. Whether it is a Megaloceros or a baby Reindeer, it certainly is very cute and one very lucky person is going to win it, can you give this soft toy a new home. All you have to do is “Like” Everything Dinosaur’s FACEBOOK page, then comment on the pink deer picture including a suggestion for the name for this super and very sparkly soft toy. It is certainly a “deer little thing” but he/she needs a name! We can’t think of one can you? Our Facebook Page: “LIKE” our Facebook page and enter the competition! The name caption competition closes on Friday 12th February. We “deerly” hope you win! The Everything Dinosaur name a soft toy competition runs until Friday 12th February 2016. Winner will be notified by private message on Facebook. The eagerly awaited Rebor Dimorphodon replicas are now in stock at Everything Dinosaur and what a splendid Pterosaur diorama these figures make. The Rebor “Punch and Judy” Dimorphodon models are in approximate 1:6 scale and represent a male and female of the species (D. macronyx). The male, nick-named Punch, is depicted as sitting on a log and like “Judy”, the female, it is available separately, but Everything Dinosaur are also offering the two models as a set, as when joined together they really do make a spectacular addition to any model fan’s collection. A very well crafted Pterosaur diorama. The diorama allows Rebor to explore the idea of sexual dimorphism in Pterosaurs. A number of fossils indicate that it was the males of the Pterosauria that were likely to possess more flamboyant crests and ornamentation than the females. Although, the dimorphodontids lack cranial crests, Rebor has opted to give their male a more colourful snout and a bright red tail rudder. These are in stark contrast to the female (Judy), which tends to have a more muted colour scheme overall. The male of the pair (Punch). Rebor are to be congratulated, they have depicted the deep skull, the dentition and robust limbs of this Early Jurassic Pterosaur very effectively. Intriguingly, the male is only just a fraction bigger than the female (eighteen centimetres compared to sixteen and a half centimetres). The fossil record suggests that the males and females of the species (Dimorphodon macronyx), were generally similar in size. This is in contrast to later Pterosaurs, such as those that make up the genus Pteranodon. In the pteranodontids, it is the males that are believed to have been much larger than the females. The male is depicted as sitting on a log. Clearly, Rebor have taken into consideration some of the more recent research into dimorphodonts. It was once thought that these flying reptiles were the Mesozoic equivalent of Puffins and that they lived near the coast and dined on fish. Studies into the teeth, jaw mechanics and the anatomy of these Raven-sized creatures indicate that they were in all likelihood insectivores and not particularly agile fliers. They have been depicted as animals of the forests, grubbing around in the leaf litter for insects, larvae and other small animals. The presence of a log for the male Dimorphodon to perch on pays homage to this idea that these flying reptiles were very much at home in woodlands. Lots of detail to be admired. The female is supplied with a stiff metal rod, which measures twenty centimetres in length. One end of this rod is inserted into a small hole in the chest of the model, the other end can be inserted into a discrete hole in the base. This permits the collector to depict this Pterosaur in a flight. The overall height of the model is around twenty-two centimetres, no glue is required, we found that the rod held the female Pterosaur model securely without the need to resort to a permanent fix. Both models have articulated lower jaws and the paintwork and detailing around the jaws is particularly noteworthy. Anatomical studies indicate that Dimorphodon was a relatively poor flier. Wing morphology and loading suggests that this deep-skulled Pterosaur would have had limited aerial manoeuvrability and may have been actually quite reluctant to take to the air. Leading Pterosaur expert, the very talented Mark P. Witton, has speculated that Dimorphodon was a Mesozoic equivalent of an extent Rail or a Grouse and that flight would have been quite strenuous, perhaps only taking to the air for very short flights – hops between trees for example. The wingspan of the female (Judy) is twenty-four centimetres and at 1:6 scale this roughly approximates to the known fossil record (wingspan up to 1.5 metres). Although very splendid replicas in their own right, the models really come into their own when united and displayed in a single diorama. The log which the male sits on can be positioned onto the base that comes with Judy. In fact, Rebor have engineered their models to ensure that there is a snug fit between this base and the log. The female can be depicted flying over the male whilst he sits, perched as if in readiness to join her in flight, who knows, a courtship between these two beautiful model Pterosaurs perhaps? The “Punch and Judy” show! There is certainly much to be admired from the latest Rebor introductions. The base of Judy even comes with a little lizard figure. Once the two models are united, this little reptile can be posed peeping out from underneath the log, as if it is hiding from the two dimorphodonts, just in case they decide to make a meal of him. Nice detail on Judy’s base including a moveable lizard figure. Well done Rebor! Both models are very well made and together they make a fantastic Pterosaur diorama. Call them “shouts”, “updates”, “e-news” or “e-zines”, Everything Dinosaur has re-formatted their email newsletter and will this year send out to the subscriber database a new bulletin every fourteen days. This new service starts on the 1st of February and it is being rolled out in response to increasing requests from customers to be kept informed regarding new models and other product developments at Everything Dinosaur. Product information, new fossil discoveries, competitions and updates. Like all of Everything Dinosaur’s commercial activities, subscribers have to opt in to receive the information. The customer database is regularly maintained and team members dedicate quite a considerable portion of their time to ensuring the information provided by customers is up to date and secure. If you send us an email requesting to be added to our e-news database, then we shall add you to our subscriber list. It would be helpful if you provided us with your name and surname this will enable our team members to personalise the correspondence. The first bulletin sent out by Everything Dinosaur will feature updates on the new Papo 2016 prehistoric animal models, a competition to win a lovely, very cute soft toy, as well as information on the biggest dinosaur discovered to date. Our work in schools gets coverage with details on helpful educational resources to assist teachers and home educationalists with their course work. The headline article features “Punch and Judy” the spectacular pair of Dimorphodon models which have just been introduced by Rebor. Future editions of our newsletter will include information on new model releases, the announcement of a major partnership programme with a figure and replica manufacturer and some exciting developments at Everything Dinosaur, including exclusive customer offers. It certainly was a “dinotastic” day for children in Jupiter and Saturn classes at Weston Rhyn Primary, as these two classes spent the day learning all about prehistoric animals and fossils. In a morning of dinosaur themed activities, the Year5/6 class (Jupiter), learned that sometimes animals believed extinct prove to be very much still with us, a little bit of homework for Mrs Jones (teaching assistant), as she was challenged to conduct some research into Coelacanths. In addition, under the enthusiastic tutelage of the class’s teaching team the children had created a Mesozoic timeline listing all the geological periods that make up the so called “Age of Dinosaurs”. This gave our dinosaur expert an opportunity to check understanding and also allowed him to furnish the class teacher with some fact sheets to help populate the timeline with various well-known dinosaurs. The budding young palaeontologists had a go at fossil casting as well as exploring the link between dinosaurs and birds. Some of the children have chickens at home (one pupil even had quails). Could they take a photograph of the bird’s feet – ample evidence here of the link between our feathered friends and meat-eating dinosaurs. The fossil handling activities proved very popular and the Year 5/6 children were given the opportunity to work scientifically, investigating a strange fossil found at the bottom of a coal mine in Illinois (United States of America). In the afternoon, it was the turn of Saturn class and the children grappled enthusiastically with the problem of what to call a new dinosaur species. We used a real life example to demonstrate some of the pitfalls when it comes to naming a new dinosaur, especially one with “big thighs”. Not wishing to see Mrs Owen (teaching assistant), left out, our dinosaur expert asked her to find out about Sir Richard Owen, the English anatomist and scientist who was given the task of coming up with a name to describe what we now know as the Dinosauria. Perhaps, Mrs Owen might even be distantly related to Sir Richard, we sent over some links and further information about the founder of the Natural History Museum (London) and asked the children could they design their very own blue plaque like the one erected at Sir Richard’s old school in Lancaster? All in all, it was a very busy day for our team member. There were lots of questions from the children, he did his best to answer them all. Even the tricky ones about how Velociraptor is wrongly portrayed in movies. Once back in the office, there was just time to email over the promised extension plans and further teaching resources to help the school’s term topic before moving onto the next dinosaur teaching assignment. The resources and additional information should help enrich the children’s learning experience and who knows, Weston Rhyn Primary might just produce some famous scientists in the future, perhaps some who will go on to be as famous as Sir Richard Owen! The ever-growing range of Rebor replicas has rightly earned plaudits from collectors and dinosaur model fans. Since the first release, a 1:35 scale replica of Yutyrannus huali (Y-REX), the portfolio of Rebor models has grown to include more than a dozen figures, mostly Theropods. However, whilst there have been a large number of reviews, pictures and a great deal of feedback about the prehistoric animals, time to add a congratulatory note about the data card to the company’s accolades. Included in the Rebor Y-REX model box. It is always pleasing to see a manufacturer take extra care when it comes to providing information about the prehistoric animal which their replica is based on. These data cards, referred to by Rebor as “bio data cards”, supplement the fact sheets that we, at Everything Dinosaur send out with purchases. Fans of dinosaurs and model collectors generally appreciate the information provided. The provision of such data cards, tends to elevate Rebor above other model makers in our humble opinion. We enjoy reading the data card, almost as much as we enjoy admiring the replica. Brief details on the “tyrant lizard king”. The picture above shows the information card supplied with the excellent Rebor King T. rex figure (1:35 scale replica of Tyrannosaurus rex). “Lovers of the Papo dinosaur range & Jurassic Park will want this on their shelves. Outstanding quality Rebor are a company that I will be keeping my eye on from now on. When I say the teeth and claws are sharp I mean it, this should not be treated as a toy but a display piece. Service from Everything Dinosaur was quick, helpful, and a pleasure would and most probably will be buying from again. Thank you MC for posting up this review, one of a great number of positive reviews we have received about the Rebor range and Everything Dinosaur’s customer service. We would like to add that the data cards are also another good reason for purchasing these Rebor replicas. 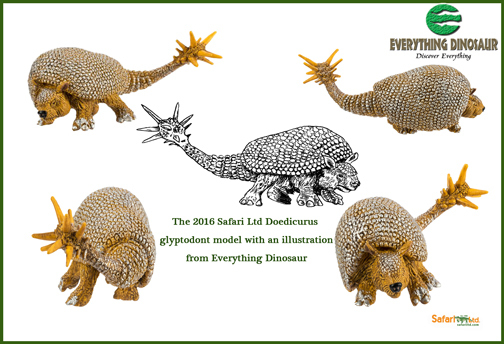 Many dinosaur fans and model collectors have been emailing Everything Dinosaur expressing their excitement about the new dinosaur models coming out this year from Safari Ltd. The Iguanodon, Carcharodontosaurus and the Masiakasaurus models are replicas that we too, are looking forward to getting in stock. However, it is worth remembering that in addition to the new models, Safari Ltd will be bringing back some prehistoric mammals. The giant sloth, the baby Woolly Mammoth, Amebelodon and the glyptodont Doedicurus figures will also be available later on this spring. Welcome back some old friends in 2016. The first of these re-introductions, the Doedicurus is already in stock at Everything Dinosaur, it is proving to be very popular. Everything Dinosaur’s illustration is in the centre. It is great to see that the recently retired prehistoric animal models made by Safari Ltd are being re-introduced in the spring of 2016. Perhaps this will start a trend for Safari Ltd, whereby they introduce retired models in future years. If this becomes a trend, this type of activity might be adopted by other manufacturers, could we see the return of the Papo Green T. rex figure, the Bullyland Iguanodon or even a Schleich Woolly Mammoth? A nearly complete plesiosaur skeleton that came to rest in marine sediments now located in northern Cambridgeshire might just prove to be a new species. The fossilised remains were excavated out of a layer of rock discovered in a fenland quarry in November 2014, by archaeologists from the Oxford Clay Working Group. A nearly complete plesiosaur skeleton that came to rest in marine sediments now located in northern Cambridgeshire might just prove to be a new species. Over the next four days the team were able to excavate and remove nearly 600 bone fragments that represent a considerable portion of the entire skeleton. Only some limb elements are missing. The fossil, nick-named Eve, represents an individual around five and a half metres in length, early indications are that the bones show similarities with another plesiosaur known from the Peterborough area, called Picrocleidus. However, Picrocleidus is believed to have been much smaller, at less than half the length of this new discovery, and its fossils are associated with much younger Jurassic strata (Callovian faunal stage), whilst “Eve” was found in rocks dating from about 165 million years ago (Bathonian faunal stage of the Jurassic). Sea monster from a Cambridge fen. The quarry is owned by building supplies company Forterra and this part of Cambridgeshire has become very well known for its Jurassic vertebrate fossil finds. For example, the first fossils of the giant prehistoric fish Leedsichthys (L. problematicus) were also found in the Peterborough area. Forterra have donated the specimen to the Oxford University Museum of Natural History, where the fossilised remains are currently being prepared and studied in more detail with a view to determining whether or not this is a new species of marine reptile. Scale bar = 1 metre. Plesiosaurs had two pairs of oar-like paddles which they used to propel themselves through the water, recent studies suggest that, just like extant penguins, these marine reptiles, some of whom could reach lengths in excess of fifteen metres, actually “flew” through the water. Nice to see that Cambridge is prepared to donate a pair of oars to Oxford, their bitter rowing rivals. A very fossiliferous area indeed! Team members at Everything Dinosaur have been able to get up close to the five new prehistoric animal models to be added to Papo’s exciting model portfolio this year. We have already reported on three of the models, namely the feathered Velociraptor, the new version of the Tyrannosaurus rex and the impressive Papo Baryonyx which should all be with us in just a few weeks time. However, we want to turn our attention to the other two models which Papo intend to release later in the year. Time to show some photographs and comment upon the new for 2016 Papo Kaprosuchus and the re-painted Velociraptor replica. This really is the pick of the bunch, when it comes to the new model introductions this year. It is a wonderful figure, a fantastic replica of the Cretaceous crocodile Kaprosuchus (K. saharicus). This fast-running ancient predator certainly captured the imagination of dinosaur fans when it was formally described back in 2009. West Africa 95 million years ago, must have been a very scary place with the likes of Kaprosuchus on the prowl. The model reminds us of the Papo Nile Crocodile figure, but the teeth and the limb position are all “Boar Crocodile” that’s for sure. The figure measures 23 centimetres in length, but naturally, had that impressive and powerful tail been stretched out behind the model, it would have been a lot longer. Based on the known fossil record, Everything Dinosaur estimates that this prehistoric crocodile figure is in approximately 1:20 scale. An impressive ancient crocodile model. A number of Papo prehistoric animal models have articulated jaws, but unlike them, this figure does not have an articulated lower jaw. In this instance it is the upper that is articulated. Once the mouth is opened those magnificent teeth are revealed in all their glory. The attention to detail does the team at Papo great credit. As well as introducing a feathered Velociraptor model this year, (see yesterday’s blog article), Papo will be adding a green version of their existing Velociraptor model. The model has been painted with a distinctive green hue. Team members at Everything Dinosaur have already nick-named this dinosaur “Echo” in honour of one of the “Jurassic World” raptors. A new Velociraptor figure from Papo for 2016. 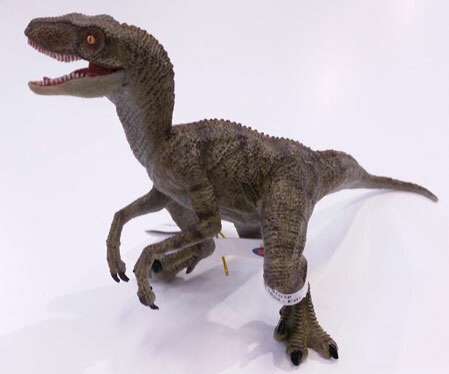 Good news, for dinosaur fans, the introduction of this colour variant does not spell the end for the existing Papo Velociraptor (Everything Dinosaur product code MOPA011, Papo model number 55023), there are no planned retirements from the Papo range this year. Everything Dinosaur will therefore be stocking all three Papo Velociraptor models in 2016. Both the Papo Kaprosuchus and the Papo green Velociraptor models are expected sometime in quarter 2 of this year (around June or perhaps July or even earlier). We are eagerly awaiting the arrival of these models in our warehouse. Team members at Everything Dinosaur got the chance to admire the five new Papo prehistoric animal models for 2016 recently, the first opportunity staff have had to get up close to the new Papo Baryonyx, green Velociraptor, the coloured variant running T. rex , Papo Kaprosuchus and the feathered Velociraptor. The models, four of them dinosaurs, certainly are quite a striking bunch (not sure what the collective noun for a group of Papo models should be), we were able to take measurements and get an idea of approximate scale. First up, the very quirky Baryonyx, much more colourful than the catalogue pictures had indicated. It definitely reflects the Papo style. Available from Everything Dinosaur in a few weeks. It is certainly a very intriguing replica, with its stripes, rusty coloured neck, spikes and tripodal stance. The new Papo Baryonyx measures 33 centimetres long and that elegantly sculpted upper jaw reaches some 16.5 centimetres into the air. This new model is bigger than the Papo Allosaurus and only slightly smaller than the imposing Papo Spinosaurus, it is approximately the size of the Papo Running T. rex replica. Based on these measurements, team members estimate that the Papo Baryonyx figure is around the 1:30 scale, but since the maximum size of Baryonyx is not known, this may be an underestimate on our part. Everything Dinosaur expects this exciting new Spinosauridae to be in its store Everything Dinosaur in a few weeks time. New Papo Baryonyx Figure is Coming Soon! Also available in just a few weeks is the new Papo Velociraptor dinosaur model. The Papo feathered Velociraptor model. Papo have gained a strong reputation for their Theropod dinosaur models, and the existing Velociraptor model is a firm favourite amongst dinosaur fans and collectors. The new feathered Papo Velociraptor is roughly the same size as the non-feathered Papo “raptor”, measuring 17 centimetres in length. The tail has an attractive plume of feathers and, as you would expect from Papo the detailing and the paintwork are excellent. A close look at the Papo feathered Velociraptor dinosaur model. Team members report that the hip height of this new dinosaur model is 7.5 centimetres approximately. Like the Baryonyx, it too, will be available from Everything Dinosaur in just a few weeks. Joining the feathered Velociraptor and the Baryonyx at Everything Dinosaur will be a new colour variant of the very successful Papo Running T. rex dinosaur model. It is the same size as the existing figure in the Papo range but the paintwork is most impressive and eye-catching. Just like the Baryonyx and the Papo feathered Velociraptor this replica will have an articulated lower jaw and on our first viewing all team members were impressed with the new style and paintwork. It is a super edition to the Papo model range. Papo Running T. rex – A Very Well Painted Dinosaur! A new version of the Papo Running T. rex. Our report and photographs of the other new for 2016 Papo prehistoric animal models (Kaprosuchus and the green Velociraptor) will be published shortly. At Everything Dinosaur we get lots of letters, emails, pictures and drawings of prehistoric animals sent to our offices. We read all our correspondence diligently and we also take the time to look at all the amazing illustrations and photographs we get sent. All those correspondents that require a reply do get one from our enthusiastic team. Below is a lovely picture of a early meat-eating dinosaur, whose fossils are known from north-western Argentina. This is Herrerasaurus and the drawing comes from Eashwar from India. A predator of riverbanks and floodplains of the Late Triassic, Herrerasaurus is one of the largest members of the Dinosauria known from this part of the super-continent of Pangaea. It measured up to five metres in length. 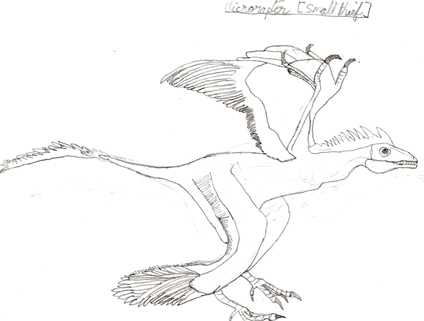 We also received a super drawing of the Cretaceous Microraptor, a dinosaur from northern China that could probably fly. Microraptor (three species are known, all from Liaoning Province, China) was one of the smallest non-avian dinosaurs. Various estimates for the length of this little dinosaur have been made, most of which suggest a length of between ninety centimetres and 1.2 metres, the majority of the length is made up of that impressive tail. Thanks once again Eashwar for your drawings, we will post them up onto our social media pages, such as our Facebook page, Pinterest and Twitter feed.